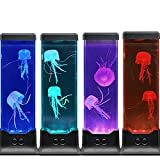 If you want to experience the truly hypnotic beauty of mysterious jellyfish up close, you can skip the underwater trip and the inevitable stings by simply raising your very own at home or on your desk at the office inside this cool new Jellyfish Aquarium. 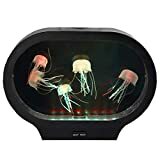 This unique, specially designed six gallon circular aquarium comes with everything you need to keep three large moon jellyfish happily fluttering around while completely mesmerizing any humans or curious cats looking in. 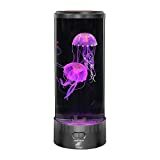 These translucent living works of aquatic/possibly alien art can also be illuminated using the tank's custom color changing LED lighting system that is controlled with a handy remote. 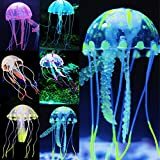 In addition to the aquarium and all the equipment, the kit includes the shipping cost for the moon jellyfish, two red leg hermit crabs, two cleaner snails, and the frozen food to be shipped safely overnight to you once the tank is all set up.